I think I have mentioned before how much I loved my Mom’s corned beef hash (topped with poached eggs) when I was a kid. She pretty much always prepared it with the canned version and even as an adult I’ve made it quite often. As my eating habits have become more conscientious though, I’ve felt more and more hesitant to use the canned stuff, especially corned beef hash. Sure, I’ll eat fresh corned beef, steaks and burgers too, all in moderation of course. But when I open that can of corned beef hash and see all that greasy looking congealed fat I can almost feel it clogging my arteries as I cook it. So this past weekend I had a package of ground turkey that needed to be used and being that it was Super Bowl Sunday I wanted a “Super” brunch. 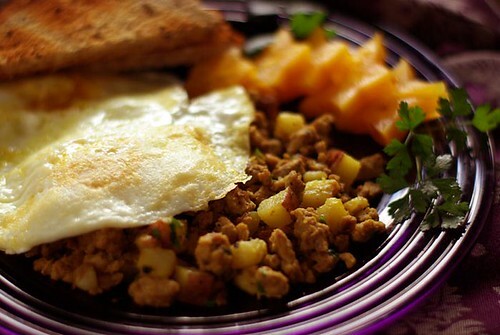 Hence what I’ll call “A Healthier Hash” using the ground turkey along with a few other things from the pantry. In order to replicate the corned beef hash flavor I started with a few ingredients common to corned beef including allspice and bay. Then, for the sake of either color or flavor I got a little creative with the mixture. Cooking down the broth step by step not only ensures that the potatoes get cooked through; the flavor of the dish really gets a nice boost from the broth. During the last 10 minutes of cooking, be sure to let the hash cook without stirring as often. This allows for some nice browning to form on the bottom; those crunchy bits are packed full of flavor. Lowering the heat a little will help keep it from burning as it browns. The whole process takes about an hour but for all that flavor and a whole lot less fat; I thought it was well worth the effort. I hope you do too! Pre-heat a 12” non-stick pan over med-high heat and when the pan is hot add the olive oil and swirl in the pan to coat. Stir in the potatoes, onions, and garlic then add the allspice, rosemary, star anise, and bay leaf. Cook while stirring often until the onion begins to become transparent (about 5 minutes). Add the ground turkey, breaking it up as much as possible as you add it to the pan. Stir the mixture and continue to cook about 10 minutes more, stirring often and breaking the turkey into smaller pieces as it cooks. When the turkey is nearly cooked lower the heat to medium and add about ¼ cup of the broth along with a few grinds of ground black pepper, the turmeric and the paprika. Stir the mixture well then cook, stirring less frequently until the pan is nearly dry (about 8-10 minutes). Continue this process, adding ¼ cup of broth at a time, until all of the broth has been cooked down, the potatoes are cooked through and some browning has begun. Before finishing, remove and discard the bay leaf, rosemary sprig, star anise, and allspice. To finish, taste for seasonings and add kosher salt and fresh ground black pepper to your taste. Stir in the chopped parsley and served topped with eggs cooked to your liking. This entry was posted in Breakfast, Entree and tagged bliss, bowl, breakfast, eggs, food, Ground, hash, onion, potato, recipe, Recipes, red, super, turkey. Bookmark the permalink. Thanks so much! I cant wait to try this. Everytime I come in here I get so hungry…reading your yummy recipes. You put so much love and thought into your cooking …and I thank you for sharing them with us! Grilled Fish 101: Two Recipes For The Price Of One!